Cutting the ribbon, from left, are Line Supervisor Chris Gruss, Tree Care Products Sales Manager Casey Gross, VP of Finance Debbie Lehmann, Product Manager Jason Showers, Welder Mike Jolman, Engineer Craig Swan, Engineering Manager Larry Voelker, and President Jim Shoemaker Jr. Standing in front of Voelker and Shoemarker is Jim Bardos, manager and operation engineer. WINN, MICH.—Amidst much excitement and fanfare, the first Boxer compact utility loader rolled off the Morbark production line. Morbar had acquired Boxer Equipment, a product line of Mertz Manufacturing, at the end of 2012. Morbark’s staff gathered to watch as the first Boxer unit completed at the Morbark factory in Winn, Mich., a model 320 compact loader, was unveiled with a boxing-themed introduction. “It’s been an amazing journey and a real testament to the teamwork and dedication of our staff,” says Jim Shoemaker, Jr., presiden of Morbark. “In the 84 days since we received the intellectual property, we have moved inventory from Oklahoma to Michigan, invested in additional long-lead inventory, set up aftermarket parts and service support for existing Boxer customers, created a production line—including weld and assembly fixtures—created marketing material, completed our first dealer training sessions, and today, completed the production of our first unit. 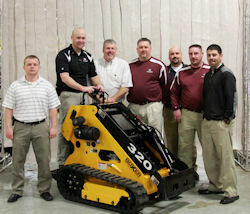 The Morbark Tree Care Products sales team. From left are Jeremy Beatty, Jason Showers, Casey Gross, Justin Longtin, Ryan Sanders, Kevin Kowallic and Kevin Edwards. Currently Morbark is working to fill Boxer back orders, as well as working with their authorized dealer network and previous Boxer dealers to ensure that customers receive service, after-sales support and fast, efficient parts fulfillment. In June, Morbark is scheduled to reach its full production capacity.